Above: Walt Disney's Smoke Tree Ranch home. Above: Walt & Lillian Disney award a lawn bowling trophy. 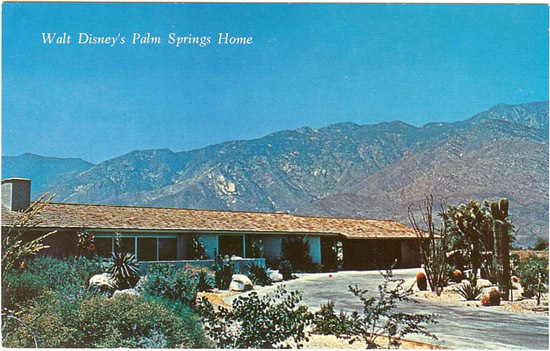 Walt Disney enjoyed getting a couple of hours away from the bustle of Los Angeles, often retreating to Smoke Tree Ranch, the gated Palm Springs community where Disney owned a vacation home. He owned two homes there over the years-- the first he sold to help finance his plans for Disneyland, and then he built a second one in the wake of Disneyland's success. 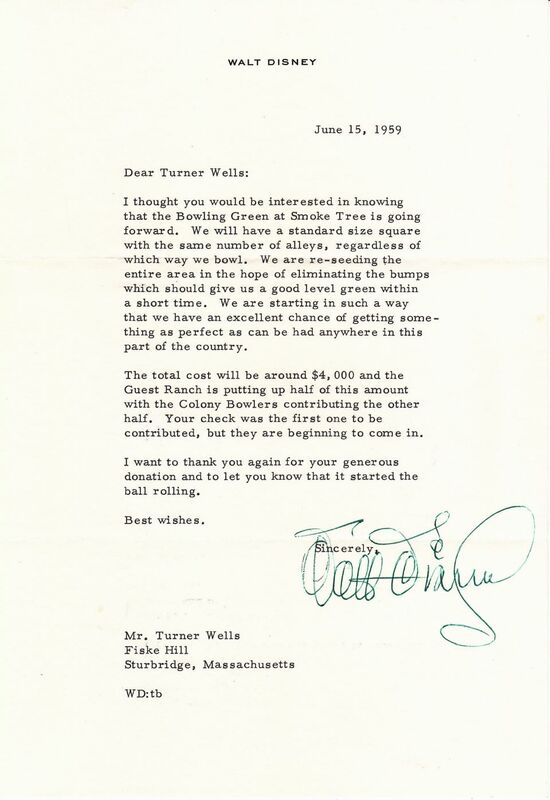 In this June, 1959 letter, Walt Disney thanks another Smoke Tree resident for his contribution to the construction of a bowling green at Smoke Tree Ranch. 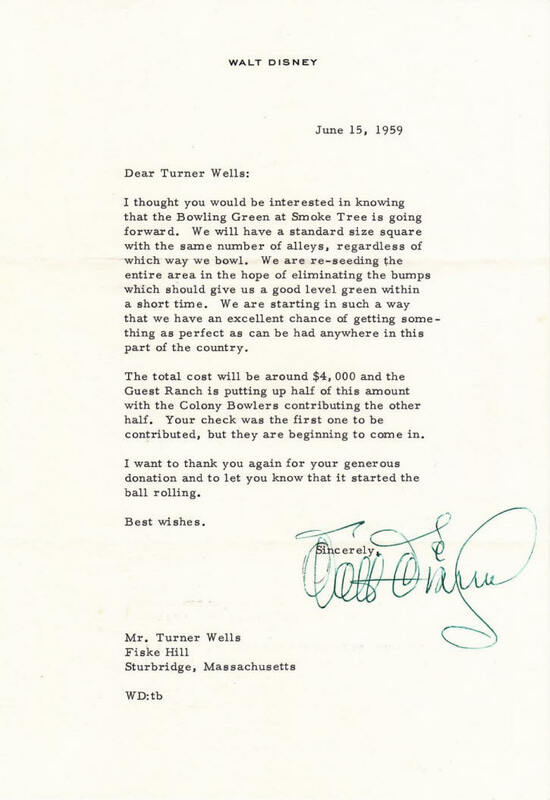 Typed on his personal WALT DISNEY stationery, the letter is boldly signed in green ink. 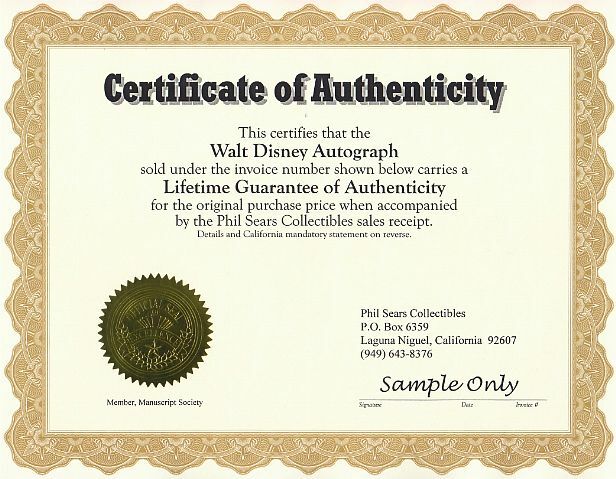 Walt has signed this letter just as Disneyland was putting the finishing touches on it's huge Summer 1959 expansion with the addition of the Matterhorn Bobsleds, Alweg Monorail, and Submarine Voyage. 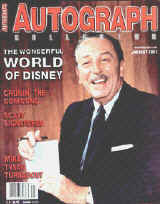 �I think he was quite happy here at Smoke Tree Ranch,� Tracy reflects in the D23 article. Walt�s love of the wild frontier lives on in films, theme park experiences, and Walt�s Chili, the quintessential cowboy meal, which is still offered at the Walt Disney Studios commissary today. Walt Disney�s True-Life Adventure: The Living Desert, which won an Oscar� in 1954 for Best Documentary, showcased the creatures and beauty of the desert. 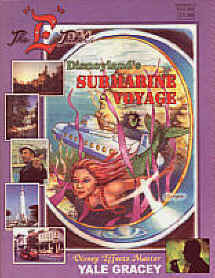 And it�s easy to see Walt�s wild-west influences in Disney parks�Disneyland Frontierland�s Stagecoach, Nature�s Wonderland, and Rainbow Caverns Mine Train were a few of the early attractions inspired by the wilderness. While many people visit the desert to enjoy high temperatures and sunshine, it was the warmth of the people at Smoke Tree Ranch that kept Walt coming back time and again. In fact, Walt's love of Smoke Tree Ranch can be seen in the many photos of him wearing a tie with the stylized STR logo of Smoke Tree. It's even sculpted into his statue at the end of Main Street, U.S.A. at Disneyland and WDW's Magic Kingdom.